The CooperVision brand was founded through the merger of leading European optical companies Aspect Vision, Lunelle, Hydron, Biocompatibles and Ocular Sciences. CooperVision brought the knowledge and experience of these companies together and the BioMedics product range is just one product of this collaboration. BioMedics contact lenses are setting new standards in the fields of lens design, material development, production techniques and correction methods. For example, BioMedics contact lenses boast a rounder edge, improved optics, an enhanced lens structure and a dynamic replenishment of tear fluid. With these innovations CooperVision has created a brand characterised by high and consistent material standards, superior additives and innovative lens structures. The BioMedics range is distinguished by outstanding comfort and intuitive handling. Through cutting-edge material technology and innovative design, BioMedics daily and monthly lenses allow you to forget about imperfect eyesight! BioMedics contact lenses are loved for their high levels of tolerance and stable design. 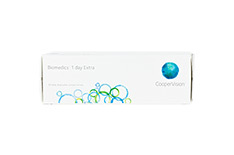 As a result they are well suited to both first-time and more experienced contact lens wearers. 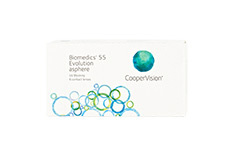 BioMedics 55 Evolution, the improved model of the popular BioMedics 55, is the classic BioMedics monthly lens. In addition Mister Spex offers BioMedics Toric for eyes with astigmatism. Both models have ultra smooth surfaces to reduce protein deposits, are extremely durable and have an integrated UV protection system. Our BioMedics daily lenses – BioMedics 1 Day and BioMedics 1 Day Toric – have the typical benefits of single-use contact lenses, namely flexible handling and the hygiene that comes with daily-fresh lenses. But on top of this BioMedics 1 Day lenses are equipped with a unique blink-friendly smooth surface and a UV-blocking filter. As well as this, the exceptional levels of oxygen permeability guarantee a comfortable wearing experience. CooperVision is the market leader in the production of “white label” contact lenses. As a result the BioMedics product range is offered in identical form under the following brand names: Diagnostic, InterLens, Mediflex, Medisoft, Ocumed, Ons Merk, Promolens, Promoday and Rythmic. Please compare the exact details with the contact lens information provided by your optician. 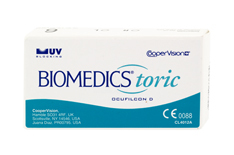 BioMedics contact lenses are also sold under the manufacturer name Ocular Sciences. Take a look for yourself and you will see that Mister Spex offers you the opportunity to buy BioMedics contact lenses at simply unbeatable conditions.